I often associate Jaegers with fog. 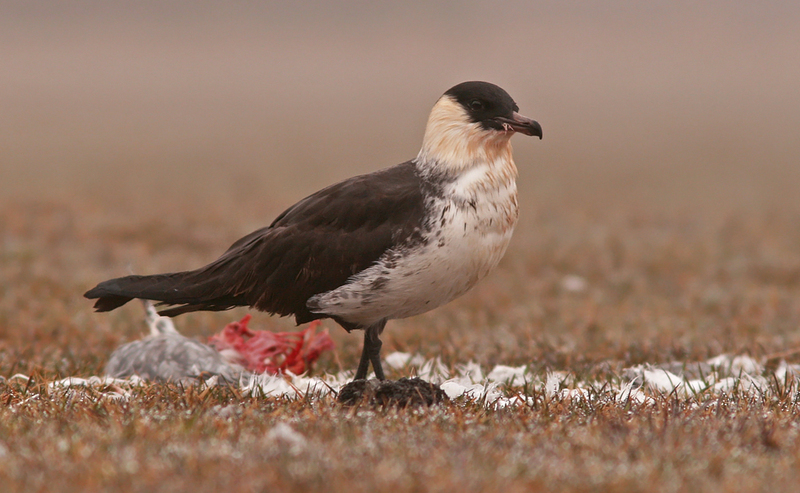 Here in Newfoundland, we most often see them in late summer as they harass the swarms of Black-legged Kittiwake feeding on capelin along our coast – often accompanied by ample fog. In my mind’s eye, I imagine them on their breeding grounds on the sub-arctic tundra, shrouded in moody mist. Heck – I can hardly even picture a jaeger in nice, sunny weather. 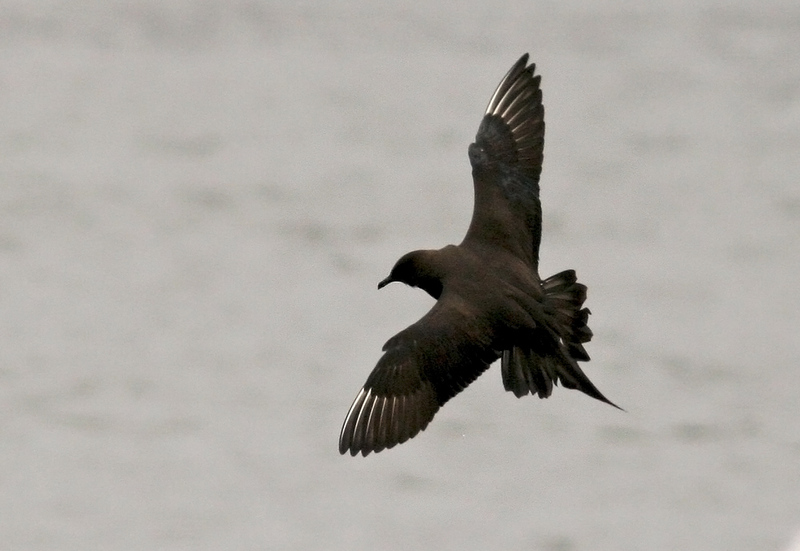 So I should not have been surprised to find myself photographing an adult Pomarine Jaeger in the fog this morning. BUT I was surprised … mostly since it was standing just metres away in the middle of a city ballfield, and was the seventh Jaeger I had seen in the city this week!! Very odd, indeed. 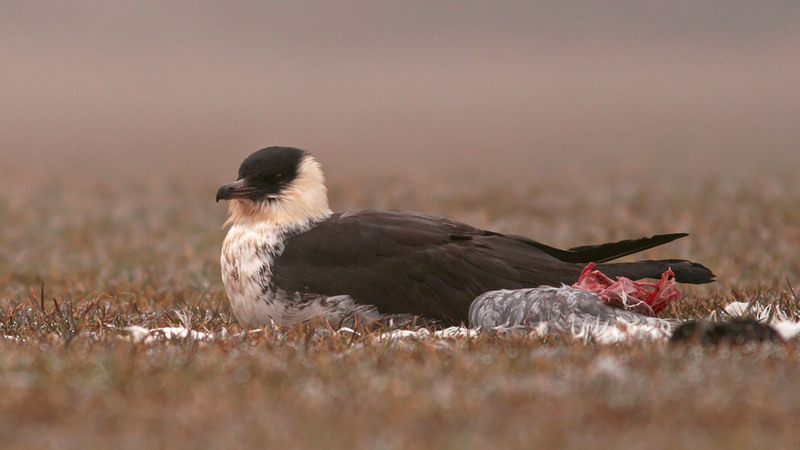 This adult Pomarine Jaeger was sitting out the fog in a St. John’s ballfield, munching on a dead gull. It was one of several around the city and part of a much bigger, very odd event taking place the past few days. 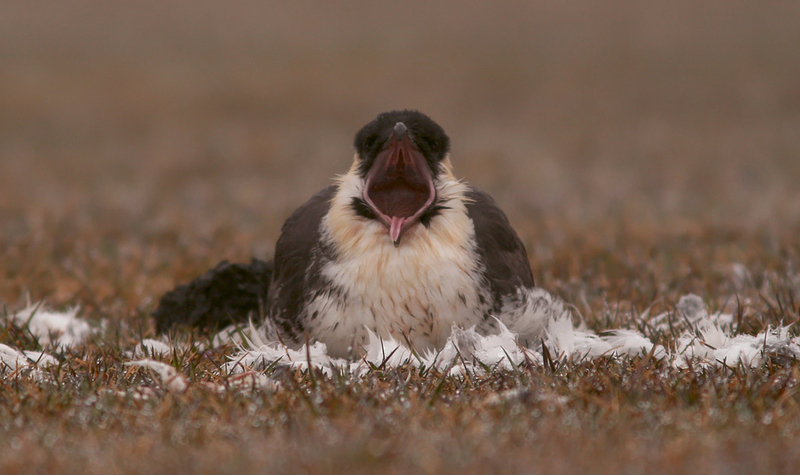 It is rare opportunity to see this majestic bird so up close and personal in Newfoundland … most sightings are distant birds harassing gulls over the ocean. The first sign that something unusual was happening came in the form of an email on April 25 … a photograph, taken by Lillian Walsh in St. Lawrence (Burin Peninsula) showing an adult Pomarine Jaeger. It was one of two that she said had been cavorting with gulls in the town harbour that morning. Seeing jaegers at such close range is odd at any time of year in Newfoundland, and especially in early spring when they are usually migrating well out to sea. We have had some moderate onshore (northeasterly) winds this week, but certainly not enough to bother these very seaworthy birds. Maybe this was just one of those strange, one-off occurrences?? Nope. Later that same day we got word of a grounded jaeger in a small green space right in the middle of St. John’s. It must have gotten disoriented in the morning fog and arrived at this unusual location. I relocated the bird an hour or so later … appearing exhausted and possibly with an injured leg. It flew short distances if approached too closely (we attempted to capture it twice, hoping to release it near the ocean), but otherwise seemed unwell. It did fly off on its own accord around dusk, but was unfortunately found dead the next morning. 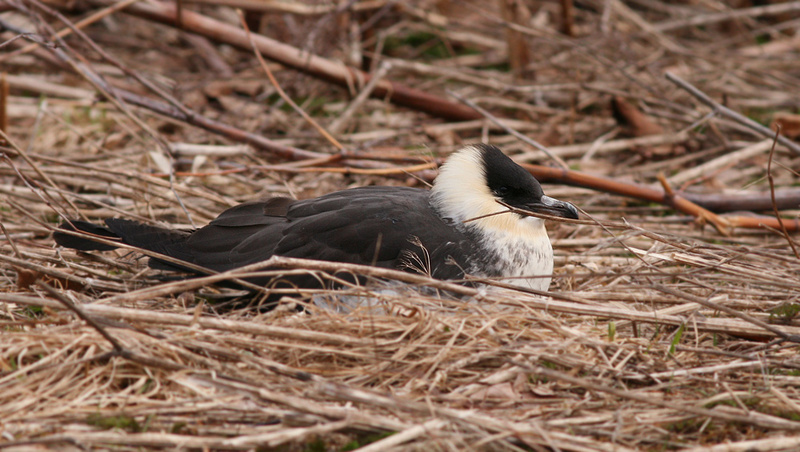 This unfortunate Pomarine Jaeger appeared exhausted and/or injured when discovered in a city green space on April 25. It eventually succumbed to its troubles and is now part of Memorial University’s ornithology collection. Since then, more than two dozen jaegers have been reported at widespread locations all over the island’s northeast coast – and there must be many others unnoticed or unreported. At least five jaegers (3 Pomarine, 2 Parasitic) have been hanging out in St. John’s harbour the past two days, resting on gravel flats near an industrial wharf and occasionally harassing the gulls feeding at a nearby sewer outlet. Another was spotted in a mid-city pond and feeding on a Ring-billed Gull carcass (did it kill it???) at a ballfield across the road. Several (including at least one Parasitic, which is even more unusual than Pomarine in April) were hanging out near a fish plant in Witless Bay, sometime appearing sickly. At least one was killed and eaten there by an otter, while another killed by a mink in Port Union (Trinity Bay North). At least five jaegers were hanging out in St. John’s harbour, including these two conspirators making a fuss with the local gulls. 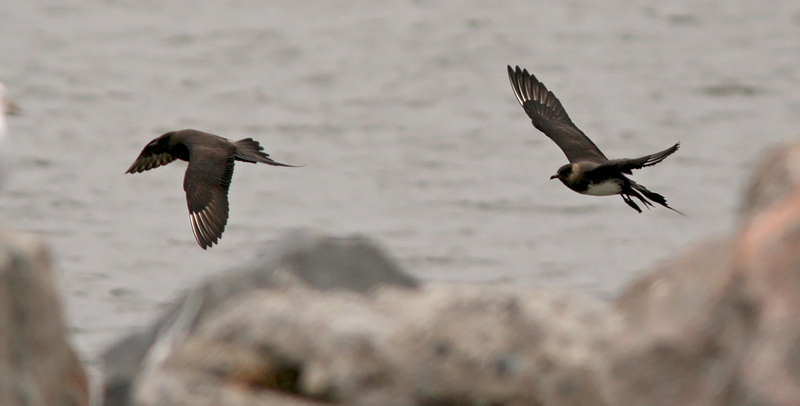 however, at least three Parasitic Jaegers have been identified. This species is much less expected at this time of year and may even represent the first April records for Newfoundland. Why this is happening remains a mystery. The weather alone cannot explain it, since winds have certainly not been “that” strong, and these birds can easily handle much stronger gales. 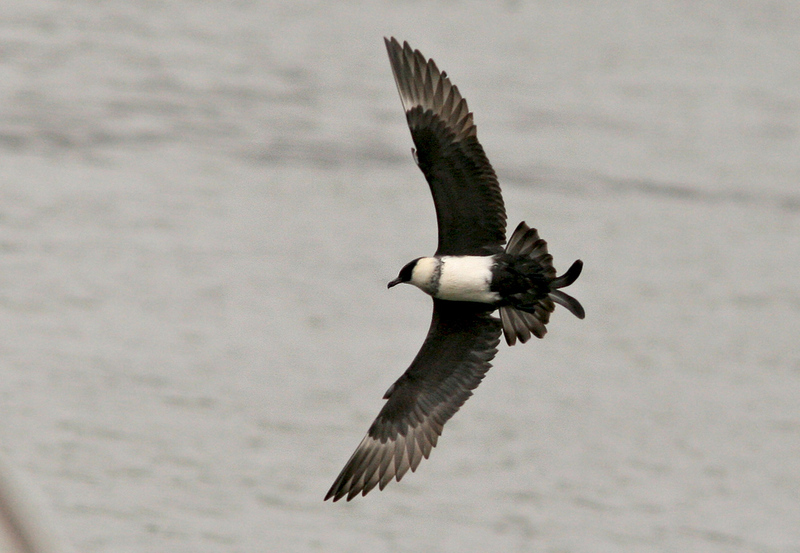 Pomarine Jaegers are regular migrants at sea in April, but Parasitic are not. 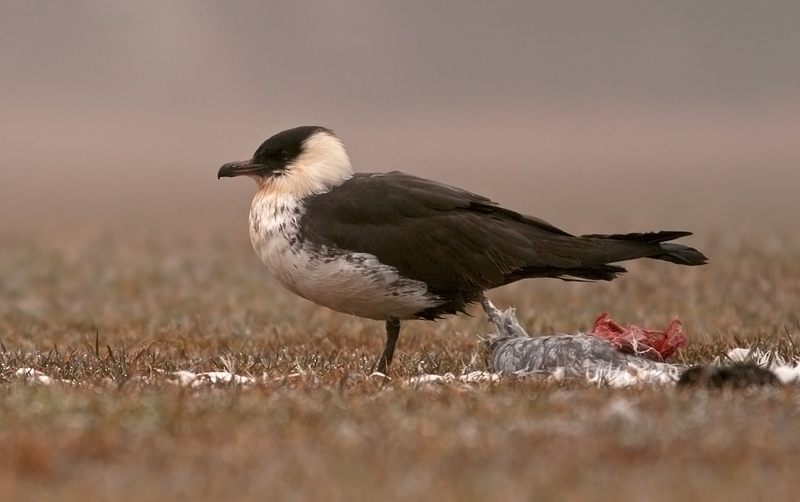 There has been no sign of starvation in other seabirds such as Black-legged Kittiwake (which jaegers most often harass to steal food from), so a shortage of food is not obvious. The widespread nature of their arrival does not support the idea of a singular environmental incident (e.g. contamination/poisoning). Some of the birds appear relatively healthy, while others quite sick and/or exhausted. Whatever the cause, it is unprecedented in Newfoundland’s birding history, and will go down in the books as “very odd, indeed”. Say “Ahhhhhhh”. After a thorough check-up, I concluded that this bird was much healthier than some of the others I had seen this week. Maybe it was the nutritious gull it was eating! 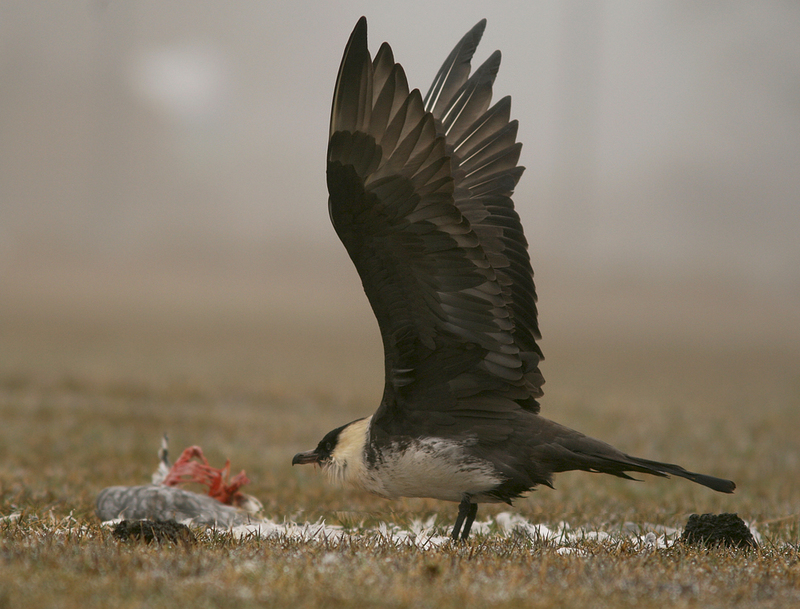 This entry was posted in Newfoundland birds, Weather and tagged Newfoundland, Parasitic Jaeger, Pomarine Jaeger, rare bird, St. John's, weather. Bookmark the permalink. Beautiful photos – thanks. Hope those birds prosper!